Yarrow plant, Achillea millefolium, is also known as White Yarrow, Milfoil, Angel Flower, Woundwort, Bunch of Daisies and Thousand Leaf. 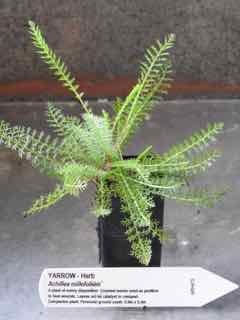 Yarrow is a useful and joy filled addition to any garden – a plant of sunny disposition. An infusion of dried yarrow flowers taken as a tea is a remedy to stem excessive menstrual bleeding. Approved by German Commission E as a remedy for gall bladder problems, liver problems and loss of appetite. Antiseptic and anti- inflammatory in it’s action, a poultice of crushed leaves is used to heal wounds. Several leaves in compost act as catalyst for quick break-down of rubbish. A companion plant. White Yarrow plant is indigenous to Europe and adaptable to most soils and conditions. Flowers are white, pale lilac or bright pink, daisy like and appearing summer and autumn. White or red flower. Drought and frost resistant. A perennial ground cover, growing to 0.6m x 0.4m. Be the first to review “Yarrow, White plant” Click here to cancel reply.